Keep the vehicle on level ground with the parking brake applied and check the fluid level according to the following procedure. 1. Place the shift lever in N (Neutral) position and confirm the engine is running at idle speed. 2. After the transaxle is warmed up sufficiently [(fluid temperature 158~176°F (70~80°C)], for example by 10 minutes usual driving, move the shift lever through all positions then place the shift lever in N (Neutral) or P (Park) position. 3. Confirm if the fluid level is in the "HOT" range on the level gauge. If the fluid level is lower, add the specified fluid from the fill hole. If the fluid level is higher, drain the fluid from the drain hole. 4. If the fluid level is checked in cold condition [(fluid temperature 68~86°F (20~30°C)], add the fluid to the "COLD" line and then recheck the fluid level according to the above step 2. The cooling fan is controlled by the engine coolant temperature and may sometimes operate even when the engine is not running. Use extreme caution when working near the blades of the cooling fan, so that you are not injured by a rotating fan blade. 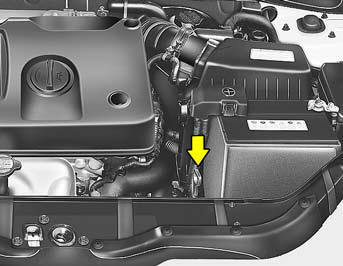 As the engine coolant temperature decreases, the fan will automatically shut off. This is a normal condition.